reprinted from: Paideuma 36 (2007-2009): 255-61. Accame’s political career began at age 17. On 25 April 1945, the last day of the war in Italy, he enrolled in the Navy of the R.S.I., the Republic of Salò in defense of which E.P. had written the inflammatory cantos 72-73. Accame claimed that he was the last volunteer of the R.S.I. By the evening of the same day he had been arrested, Fascism and the R.S.I having come to an end. While he often wrote on economics, Accame became interested in E.P. only late in life, though his family connection could have led him to The Cantos. He spoke at some Pound events organised by the Right, but eventually befriended the more respectable scholarly set. In 2002, for the Italian television network RAI he curated with Sergio Tau a series of documentaries, Intelligenze scomode del Novecento, on controversial 20th-century right-wing figures like Céline, Marinetti, Mishima, Junger, Gentile and Pound. He was also interviewed at length for a 2005 documentary, strangely titled A Baby in the Woods – Il sogno infranto di Ezra Pound, directed by Leopoldo Antinozzi, and produced by Rai Educational. In 1995 he published for a small publisher his interesting book Ezra Pound economista – contro l’usura, which I reviewed in Paideuma 26.1 (1997): 137-40. In 2008 Wayne Pounds, a Pound scholar in Japan, published (in the on line journal FlashPoint #11 ) segments of his translation of this work, but the translation is so faulty as to be nearly unintelligible, and often says the opposite of the original. Both Accame and Wayne were aware of this (I told them), but they decided to go ahead and make the “translation” available experimentally. A synopsis of Accame’s well-argued points about Pound’s economics can be found in my Paideuma review. Essentially, Accame claims that Pound’s obsession with monetary matters, which until recently, when social conflict was at the center of world politics, could be dismissed as cranky, has become more understandable and relevant today, when finance rules the world and we know less and less what money really is. 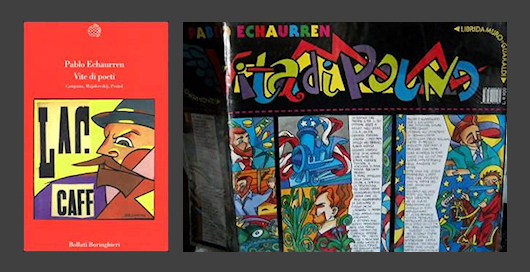 Accame was also friendly with the brilliant painter Pablo Echaurren, who produced an inventive comic-strip life of Pound -- reprinted in Echaurren, Vite di poeti (2000). Accame participated in the 2005 International Pound Conference, when he introduced his Pound documentary of 2002. One of his last public statements was in connection with Giulio Giorello’s controversial article “Elogio libertario di Ezra Pound” (Corriere della Sera, 18 February 2009). He was asked by the Corriere to comment on left-wing re-valuations of Pound (like Giorello’s), and he was glad to point out that since the 1970s Pound has been studied and appreciated by scholars of all political orientations, citing as an example the Italian version of my book The Forméd Trace. When I last spoke to him on the phone I asked him about the infamous Casa Pound – a group of neo-Fascist thugs in Rome, who have made themselves conspicuous and given Pound a bad name in the Italian press (which has usually taken little interest in Pound’s fascist side). Accame, given his politics, took the position that “boys will be boys” – there are turbulent left-wing youngsters, so why not the same from the other side. He didn’t seem to realize how damaging a Casa Pound on the front pages of the national press is to a dispassionate consideration of Pound’s sins and virtues. The fact that Accame only discovered Pound in the last decades of his life, despite the family connection to Carlo Delcroix, actually shows how marginal Pound was to Italian Fascism and its successors. Now however, because of Casa Pound, the connection is being brought home with a vengeance. Accame would have been more pleased to be remembered as a passionate writer, social thinker and, why not, as a proud Italian. (His family came from Loano, on the Italian Riviera, though he lived mostly in Rome.) He loved the Usura canto, and he must have been delighted by E.P.’s many celebrations of his father in-law, who even gets transferred to a Na-Khi landscape after grasping the “magnificence” of Gesellite theory: “Delcroix: ‘che magnifica!’ / (prescrittibile) / he perceived it: / The green spur, the white meadow...” (101/736). — and a youtube video of a selection from Ezra Pound - Da "Intelligenze scomode del Novecento", featuring a segment with Massimo Bacigalupo. Ezra Pound- Da "Intelligenze scomode del Novecento"
contains a segment with Massimo Bacigalupo.